CH Products continues to bring solid durability, realism and programmability to your fingertips the new CH Eclipse Yoke. 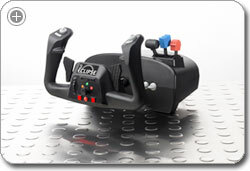 With its three color LED mode selector, this newly designed yoke features programmable trim/scroll wheels with center push function, fingertip paddles for flight and racing sims, and numerous hats and buttons, the CH Eclipse offers 240 programmable functions with the CH Control Manager Software. From LA to Sydney, over torrential bodies of water and massive terrain, through farmlands and wetlands, the CH Flight Sim Yoke has been a constant companion in the countless journeys you have taken for many, many years. It is time to finally retire that indestructible co-pilot now and say hello to a new friend -- the CH Eclipse Yoke. Give your flight simulator an incredibly realistic feel with the CH Products Eclipse Flight Sim Yoke. Six analog 10-bit axes give you control of the aileron, elevator, throttle, propeller pitch, fuel mixture, and rudder. The yoke's ergonomic grips add comfort to your flights, while the non-binding floating shaft enables smooth, prece steering. With the help of the included software, you can program the yoke's many buttons and fingertip paddles with up to 240 functions. The Eclipse Yoke mounts easily with the integrated desk clamps, and connection is a breeze with the included seven-foot USB cable. Realistic 6-axes movement and control. 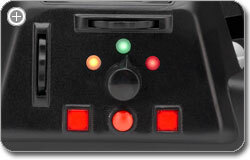 Wide array of buttons can be programmed for up to 240 functions. Sturdy construction; 7-foot USB cord. Experience realistic flight controls with the Eclipse Flight Sim Yoke. View Larger. Programmable buttons allow for up to 240 functions. View Larger. Featuring many of the buttons and switches you'd find in an actual cockpit, the Eclipse Flight Sim Yoke greatly enhances flight simulator programs. Six analog 10-bit axes give you control over aileron, elevator, propeller pitch, fuel mixture, throttle, and rudder movement, and the colored handles for throttle, prop, and mixture let you fly with confidence. The Eclipse also features a programmable trim/scroll wheel with a center push function, an eight-way POV hat and rocker switch on the left and right sides of the grip, and a three-color LED selector dial. Adding to the yoke's authenticity are two backlit pusher buttons, a traditional push button, two two-way flipper switches on the base, and two traditional push buttons on the back of each grip. The fully programmable fingertip paddles work with both flight and driving simulators, and the free-floating, non-binding shaft enables smooth movement for added control. Thanks to the included seven-foot USB cord and integrated desk clamps, you can position the Eclipse wherever it is most comfortable and convenient. There are no drivers to download or install, and you can set up the rockers and switches up to 240 different ways with the included Control Manager software, which is compatible with both Mac and PC operating systems. Your Eclipse Flight Sim Yoke is constructed of quality industrial components, with a large sturdy base that keeps it firmly in place during flight simulations. Also, the Eclipse can be clamped to any desk or table from 3/4 inch to two inches thick. The CH Products Eclipse Flight Sim Yoke is backed by a two-year limited warranty. CH Products Eclipse Flight Sim Yoke, Control Manager software, and seven-foot USB cable.